Forgive me, for I am an ignorant MOCer who hasn't kept a set designed by Lego longer than a week, and whose apartment doesn't see a set in its package for much longer than the evening it's brought home, but I'm not sure I understand the interest collectors have in "polybags." What is it about polys that makes them a special category from a collector's point of view, and distinct from, say, a small boxed set? I assumed it was because they are often "promotional" in nature but that would appear to be an archaic assumption, since many polys can simply be bought at retail stores, etc. So why the interest? Fun, simple, & inexpensive.....& did I say fun? I mean, sure, but I'm still not sure I follow what the difference is between a poly and a set like this one or this one? ....to me the difference is about $2.00. Those little box sets are fun, too, but aren't they like $5-6.99? The attraction of polybags for many is the 'thrill of the chase'. Some may be available at retail in your country but the majority are not so you have to go out of your way to find out where they are available and then try and acquire them which often involves trading with other collectors. All of the above, plus they are small and easy to store if not on display. Polybags go on seasonal clearance at some locations so it is easy to stock up on them. Also it can be a cheap way to obtain a difficult figure (like the Robin Cycle a couple of years back). Store exclusives are nice too such as Rocket Racoon and the Brown Ninja (do these minifugres really count as polybags though?). Those little almost cube shaped mini box sets are cute but polys are more efficient on many levels. they cost less to ship and can just be put in a bubble mailer. they are also super easy to store away. I love them as they have great value as opposed to boxed sets. I think the Star Wars models look pretty good on a shelf. Recently, I picked up the Creator Fast Car from Kmart, which cost $4 for almost $6 worth of parts. Not bad, if I do say so. Plus, it looks a whole lot like a vintage Porsche. 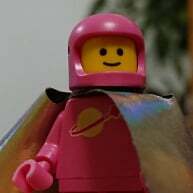 I have learned about a lot of different aspects of LEGO collecting and building from reading BRICKSET, and I haven't been following it that long. Specifically collecting polybags was one of the things that "surprised me" when I first heard about it, but of course now I keep my polybags sealed. :) I did open my Hulk though. I have a few Mc Donald's LEGO polys that I found at a yard sale for like a quarter a piece. I was excited just to find LEGO at a yard sale. The polys probably aren't worth that much but I have them displayed in my LEGO room. The reason I haven't opened them is that the elements inside are worth more TO ME still sealed than they would be if I opened the bags and used them in an MOC. The WHOLE sealed polybag becomes a collectible in itself. I also have a Gandalf polybag that I'm pretty sure has the same minifigure you can find in other LOTR sets but the fact that he's still in that sealed package now makes him "special." Collecting small sets and keeping them sealed could be another way of collecting LEGO. The possibilities are endless. And I guess the key word is COLLECTING. Sometimes people who don't collect can't understand why collectors don't open their LEGO sets or action figures or what not, and visa versa. GASP! You TEAR APART your LEGO sets!!? I was once APPALLED at the fact that people were ripping apart their minifigures to make customs. I just started to get into LEGO photography and now I have minifigures that are missing their hands and/or heads because I put them on someone else in order to make the picture I have in my head. HARLEY-DAVIDSON enthusiasts have a saying, "If I have to explain it to you, you wouldn't understand." I think it really is a collectors vs. builders thing. Is there some big qualitative difference between a polybag and some other small set? No. But it's an arbitrary line that lets folks say "The things on this side of the line I collect; the things on that side I don't", and yeah, I do think the "collect and keep sealed" folks are way more likely to care about the distinction. Personally, I think it's heresy to keep Lego boxed up and not build it, but I suppose everyone has different ambitions, and it's not my place to judge. To me, the small polybag sets are just small sets. And like most sets, I look at the parts and say "Meh, I'll BrickLink instead." But to me, "it's a set" doesn't have value; to other people, it does. Polybags are the only sets that are kept sealed in my house, BUT, only if they are they are doubles of ones we have opened before. All polys that we don't have are opened. All other sets are opened and played with. I certainly don't have the money, or inclination to store, say, modulars for years in their boxes. I can see the appeal of poly bags for investors. They do allow for a small investment. You could already invest for 5 euro. Many of them are also relatively rare and hard to get wich makes them a promising investment if lego collecting will become big one day. On top of that most of the poly bags are also realy well designed,i love all of them. I basicly only buy big sets and poly bags now. To bad I always build my polybags right away and throw away the poly bag,so not much investment for me but I can see their appeal. They are the smallest representation of what you can consider a complete set. What's not to love? I think there are probably several factors that drive polybag collecting. - As @Huw says, they aren't readily available, so there's an element of 'treasure hunting' involved. - Price. Compared to anything but the smallest sets, they are wallet-friendly. At least if you can get them when they're first released. The secondary market, not so much! -Storage. One of the biggest problems for the avid Lego collector is 'Where do you keep it all?' Even a modest collection can take up a significant amount of space if you keep the boxes intact. But a medium sized plastic crate can hold a hundred or more polys. - They become 'currency'. I don't consider myself to be a polybag collector at all, but I do pick up the 'easy' ones, from newspaper / Shell giveaways and the like. As a result, I've got 80 or 90 without really trying, and they come in handy for trades and so forth. Many of them are also relatively rare and hard to get wich makes them a promising investment if lego collecting will become big one day. A couple other fun things to do with poly bags. I like to open a bag and build "blind". Basically while looking at the instructions, but not the parts in the bag I will feel for a part and try building without looking. Another fun thing to do is see if you can assemble a set without opening the bag. Sure silly little things, but difficult to do with a larger set (even the boxed ones). Also a cheap set to get multiples of and race to complete.